What makes a truly awesome bedroom? 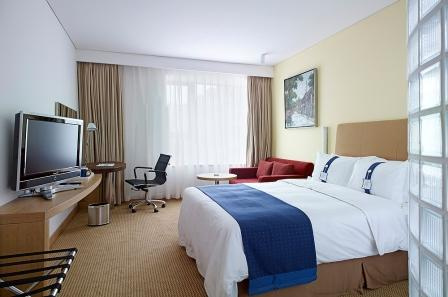 Of course, it all starts with an amazingly comfortable bed, one that you can’t wait to jump into at the end of the day. Many bedrooms, however, can end up over-cluttered with cumbersome storage solutions. This can drag their style credentials down and make them look smaller. To avoid problems like this, take a look below at the essential accessories you need to keep your bedroom looking and feeling its best. The right window dressings. So many people think just of aesthetics when choosing bedroom curtains and blinds, but you also need to consider light-blocking too. Luckily, blackout curtains such as those from Julian Charles and other luxury retailers look amazing as well as helping you get a great night’s sleep. Great quality, stunning looking sheets. A new bedding set can be a wonderful thing, transforming the look of your room and making your bed much more comfortable. Invest in some seriously stylish sheets and enjoy that first night’s sleep once you’ve got them home. Angled bedside lamps. These crucial accessories help to manage light levels in the room, so you can turn the main light off and lower light levels ready for sleep. Angled lamps also help late night readers to carry on without disturbing their bed-mate. A comfortable rug. There’s nothing worse than hopping out of bed on a chilly winter’s morning only to freeze your toes off on an ice cold floor. Soften the blow with a luxury, thick pile rug, which can help to create a glamorous boudoir feel as well as having very practical benefits. A seat. This is an often overlooked accessory in modern bedrooms, but it’s just so useful to have an elegant chair, padded ottoman, small sofa or even a glamorous chaise longue to perch on. Whether for having a conversation with your partner while getting ready for a night out, or slinging clothes over after said night, a seat of some kind is a very useful addition to a bedroom. Clever storage. The biggest of your bedroom accessories, storage space needs to be chosen very carefully, especially if you’ve got a lot of stuff. You want to be able to access it easily, but without the storage solution taking up too much bedroom space. Sliding door wardrobes and bespoke units are both great options, so put the time in to find the right one for you. Of course, your bedroom would be nothing without a fantastic bed, so put this right at the top of your list when shopping for accessories. It’s not easy being a parent at times. Lots of us use our bedrooms as a little sanctuary. Sometimes it’s handy to just close the door and have a quick breather before dealing with the next mess. I would love to find the time and energy to make a few changes in here, though. After all, the bedroom is more than just a room for sleeping in. If you’re thinking about redesigning your bedroom, then I’ve got some great ideas to help you. I’ve been browsing some of the New Year sales. There are a lot of new bed types out there! Gel Foam and Memory Foam that promises to keep you cool and comfortable all night sound very appealing right now. Having children around means lots of early mornings and disturbed nights. I want the little sleep I do have time for to be the best quality it can be! Of course, you can change other details in the room too. You can change the decor. I would love to have wooden flooring in my bedroom. It’s so chic and also so much easier to keep dust free. I’ve even been looking at reclaimed wood flooring to get that cute antique look I like. Then I can pop a soft rug down to wiggle my toes through last thing at night. Bliss. I’ve heard that a darker room promotes better sleep. It’s not often the sun is up before me, but some blackout curtains are always a good idea. They keep the heat of the summer sun out of the room so the temperature in there might be easier to handle. I think I’ve already made up my mind to buy a portable air conditioner for my room! At least, a wooden floor will keep me cool when I’m hot. The bedspread can feature just the splash of vibrant color your room needs to look really stylish. Pick some wall art that shares some of the same tones. Your curtains can also feature the same palette. It helps to tie everything in together, even if you haven’t bought a matching set. It’s a great way to get the look you want. You might also think about changing the position of the bed. Changing the bedroom furniture around could free up some extra space for a new dresser. Fitted wardrobes are great until you want the room a different way around. Still, at least I won’t have to worry about the carpet dents left behind if I’m putting down a new floor! It will be so nice to get some new furniture for the bedroom. I sometimes like to catch up on social media in bed at night. I could do with a good nightstand for the laptop or tablet. 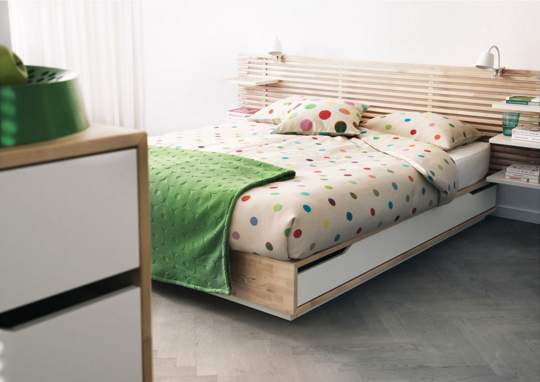 If you need a larger surface next to your bed, you could always repurpose a low level chest of drawers. Even a TV cabinet can work for this task. Some fitted units are just too small for anything but a lamp. Sleep is so important, and I know it’s much harder to cope with the trials of motherhood when you’re sleep deprived. Perhaps I should look at changing the kids’ rooms to see if that gets them to sleep more? The living room is a very important part of your home. It’s the room people are likely to see a lot of. So, you have to make sure it looks good. In this piece, I’ve got some ideas that will give your living room a modern twist! I think that every living room needs a coffee table. It doesn’t have to be massive, and small ones make a big difference. The trick is finding one that’s very modern in its design. You don’t want an old-fashioned coffee table because that will make the room feel old. But, a modern one will help to increase the appeal of the room. You can have it in the centre and add bits and bobs to it. Think about getting a classy coffee table book to place on it. Or, maybe some minimalistic candles to boost its design quality. Laminate flooring is very ‘in’ right now, the days of carpet are over! Having a laminate floor in your living room will give a very modern vibe to it. It combines the class of a hardwood floor, with a unique modern twist. What makes it so great for a living room is that you have the option to add accessories to it. Something like a lovely teal rug would go great with a laminate floor. The colours go well together, but it also has other functions. It gives the room a more homely feeling while maintaining that modern edge. This is exactly the thing you’re looking for in the living room! These days, interior designers recommend you throw away your patterned wallpapers. By patterned I mean ones with crazy designs and lots of colours. Instead, you should focus on the old saying ‘less is more’. Fewer colours and a more minimalistic design will work wonders for the interior of your living room. Hanging art on your walls has become a big trend in the last few years. It’s one of the best ways to add a modern twist to your living room. However, you do have to be careful deciding on what art you’ll hang up. You focus should, obviously, be on contemporary art. I find that canvas paintings are super modern and look great. If possible, get some modern canvas art hung in your living room. Don’t put too much up, a couple of pieces will do the trick. They’ll bring the room together and make it look awesome. Obviously, furniture is a very important part of the living room. Every living room will have a sofa or some chairs for people to lounge around in. The key is finding furniture that looks modern. Leather sofas are an example of modern looking furniture. But, you can also get non-leather ones that look just as great. Also, corner sofas are a great idea. They maximise space and look new and contemporary. So, if you want to spice up your living room, use these ideas. They’ll take your room into the 21st century and give it a lovely new design. Perfect for anyone wanting to modernise the interior design of their home. 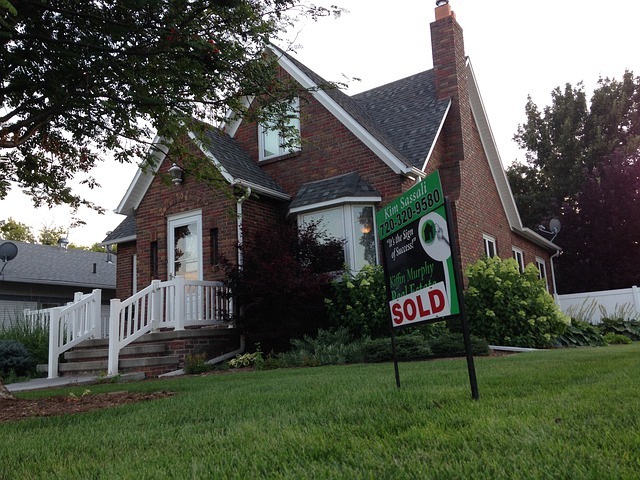 3 Simple Steps To Help You Sell Your Home Fast! Selling your house can be stressful! But, with these simple steps you can have a quick sale in no time! Before putting your house on the market, it is best to invest some time and money into a few home improvement projects. SHS Roofing believes a house with an updated roof is more attractive to buyers because of the money they’ll save in the future. Exterior upgrades are incredibly valuable to potential buyers. The best way to get a quick sale is to sell at the best time. But, when is the best time to sell your house? In general, you should look at the property market. See if business is booming and houses are being sold. If the property market has slowed right down, don’t expect to see a quick sale. Wait for things to pick up again! Similarly, the time of year can play a big impact on sell success. It’s never a good idea to sell your home in the summer because that’s when people are often away on holiday. Winter is also a bad time to sell because not many people tend to think about moving home at the end of the year. Think about selling in that Autumn period between summer and winter, you’re far more likely to get a quick sale. If you want to sell your home fast, you’ll need to let people know it’s up for sale. This means advertising it in as many places as possible. I’m talking about various property websites online, as well as in local papers. You aren’t going to get a quick sale if you only advertise your home in one place! You need to get the word out there, let homebuyers know there’s a house for sale. I also recommend using Facebook to advertise your property. You can post a status with the details and asking price of your house, for people to see. Also, you may find local groups or pages on Facebook that are ideal for advertising your home. This lets you directly advertise your property to people in the surrounding area, for free! An estate agent is someone that can help you sell your house. It’s in their job description to seek out prospective buyers and advertise your home. If you go to Entwistle Green, you’ll be able to search for an estate agent near you. It makes sense to hire an estate agent because they can help you get a little bit more out of your house. If you’ve been trying to sell your home by yourself, and having no luck, this is a step you should take. Of course, you can hire one at the start to save you a lot of hard work. Remember, you’ll have to pay them a fee and sometimes this is a percentage of the sale. So, they may make it easier to sell your house, but it will cost you more than doing it yourself. Naturally, the choice is up to you! One thing’s for certain, selling your house will be way less stressful if you do things this way. That’s the worst thing about selling a home, the stress of not finding a quick buyer. If you follow the steps above, I can almost guarantee you’ll have a successful sale. Clutter makes us feel more stressed and edgy, and that’s the last thing you need if your small bedroom is your main sleeping space. It sounds a bit too easy, but this has the effect of getting you started on a major tidy up. Once you’ve embarked on a task – even with a small step like this – it can create momentum that leads to the next step, and the next and so on. Procrastination is a constant enemy for so many of us; making an easy start and securing a ‘quick win’ can help defeat it. Making the bed properly means just that; don’t just throw the duvet over the sheets. Fluff the pillows up and remove anything that shouldn’t be on the bed such as those few bits and pieces of clothing, your Kindle and the magazine you’ve had kicking around for months. If you have a television in the bedroom, consider mounting it on the wall to get it up and away from the surfaces. Straight away you’ll have more room and likely be making use of a blank wall space. Lighter colours create an impression of spaciousness. Another great thing about re-painting is it will likely encourage you to have a good clear out while you’re at it. Perhaps you’re thinking of changing that old bedstead that you’ve chucked things underneath over the years for a fresh new divan bed base? If so, you’ll need to get rid of the clutter you’ll unearth. If you’ve a tendency to leave wardrobe doors, drawers and cupboards open then try and get into the habit of shutting them. Open drawers and a wide open wardrobe door can make a bedroom look cramped and untidy and draw attention to piles of ‘stuff’. If you’re in a position where you struggle to shut doors and drawers properly, investigate potential organisers such as under bed drawers and storage containers. Heavy winter jumpers and clumpy shoes can be stored away during the warmer months. Conversely, lighter summer wear can be removed and stored when the evenings draw in and temperatures fall. If you don’t need it to hand then don’t keep it to hand. This might encourage you to dispose of clothes that have seen better days or that you know you simply never wear any more. Make sure you store clothes carefully, though. It may be that no matter how tidy you become, there is simply not enough room and it’s too difficult to keep the room tidy. If so, a major clear out is required. Get rid of furniture that attracts clutter and be prepared to take drastic action. This can be difficult as we’re all a bit loath to throw things away. The draw of a clutter free room should inspire you to finally bite the bullet. The thought of having loved ones over is a fantastic prospect, but creating the ideal room can be daunting. Here’s how you can battle back against those fears to make a guest room fit for royalty. In almost every case, the guest room is going to be the smallest bedroom in the property. Consequently, making the most of the space is vital. You can’t physically stretch the dimensions of your guest room. However, there are ways to make the room feel larger than it actually is. Tricking the eyes will improve the overall feeling towards a space, and the guest room is no different. Your guests won’t feel comfortable if the room feels cramped. So be sure not to clutter the room. Opening the space is the perfect foundation. Your guests probably aren’t going to spend much time in the room as they’ve visited to see you. Nonetheless, their limited time in the room should still be made comfortable. The likelihood is that they won’t want to hassle you during the night. They already appreciate the offer to stay and don’t want to be a burden. With this in mind, you should make it your job to ensure they’ve got everything needed for a comfortable night. Fresh bedding goes without saying. However, you should ensure that the heating works. Similarly, you might want to leave a desk fan in the room just in case they get too hot. We all know the importance of a great night’s sleep and how it can impact your waking hours. It’s even more significant when not staying in your own bed. Do everything you can to make their stay is as comfortable as possible. The people staying in your home aren’t random guests. They are your friends and family. Treat them that way. You could invest in a digital photo frame to create a personal feeling to the room. The beauty of this option is that you can update the images to suit each guest that stays. While you aren’t going to invest in bathrobes for each individual guest, you could buy a ‘his and her’ set to add a little luxury to their stay. Top it off by placing a box of chocolates in the room and your loved ones will soon think they’re staying in a top hotel. The truth is that your guest room isn’t going to be used that often. It can be easy to forget about the space, which can lead to it being left to suffer. The best way to combat this threat is to use the room all year round. Using it as a storage space isn’t advised. However, buying a sofa bed instead of a normal bed will allow you to use it as an extra area for daily recreation. Having somewhere to relax with a good book or magazine will be a welcome addition to any home. Besides, you’re more likely to clean the room regularly if it’s actually being used. 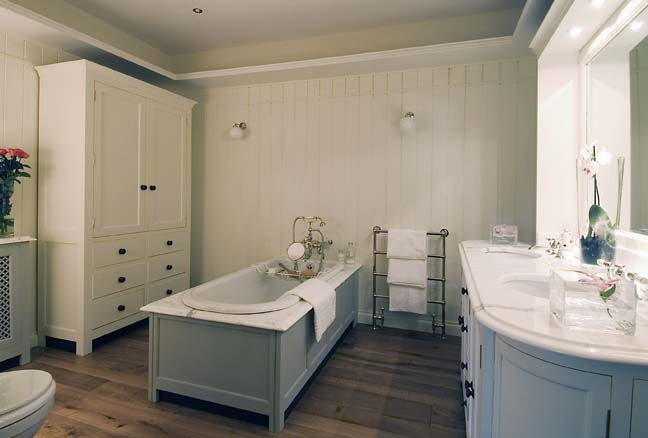 We often think of bathrooms as purely practical rooms. We need them for washing and performing bodily functions, and it’s difficult to get along without them. However, they don’t need to be ugly and boring. We can enjoy our bathrooms just as much as we do any other room in the house. We should use them at our leisure, instead of rushing in and out in the morning or evening in between getting other stuff done. If you want to make the most out of your bathroom, you can make it a more luxurious place to be. Get some ideas from the suggestions below. You might think that you need to install a bath to create a luxury bathroom. But if you don’t have space, or you simply don’t take baths, you don’t need one. Baths tend to be an occasional treat, so you might feel that having one would be a waste of space. A lot of people would much rather have a luxurious shower, with a large shower head, great water pressure and plenty of room to move around. You can choose from a selection of shower enclosures to find a design that’s right for you. With an excellent shower, you can enjoy your bathroom every day, instead of only once in a while. If you do decide to install a bathtub, you need to pick one that you won’t want to get out of. A lot of people already own a bath, but it’s often cramped and they don’t make use of it often. There are so many different designs to choose from, whether you want a free-standing tub or a fitted one. If there’s room in your bathroom, you can have one that has plenty of space for you to stretch out. But don’t forget you’ll need a shower too, either above the bath or separately. The lights you choose to use in your bathroom can have a significant effect on how it feels. Picking the lights you use in your bathroom could create a beautiful atmosphere that you love relaxing in. One of the choices you can make is to install a dimmer switch so that you can adjust the lighting levels to whatever you desire. If you want a long bath or shower, you can lower the lights to create a relaxing atmosphere. You could also add some colourful lights or some beautiful fixtures to make things more interesting. If you look at a lot of modern and luxurious bathrooms, you’ll find that many of them are done in fresh and contemporary colours. For example, you’ll find black, white, greys and other neutrals. You might not think these shades are very exciting, but they create a clean and often expensive look. You can be more colourful though, perhaps using some pastel shades to go with your period bathroom or tiles in a dark blue or green. Bathrooms don’t have to be purely functional. If you’re bored with yours, reinvent it so that it’s somewhere you love to be. Space is something we all want to gain in our residences. Or we have enough space, and we think about doing something smart and useful with it. The wardrobe is a crucial piece of furniture or practical space. We need it to keep our belonging organized, but the need to use space in a modern, creational and useful way makes us think that old wardrobes, under the shape of cabinets, cannot meet our demands. We need new ideas and solutions to integrate the wardrobe into our living space without being too obvious. So if you are looking for some inspirational ideas for your bedroom wardrobe check Urban Wardrobes main website or their account on Houzz. We want our living space to appear more balanced, so heavy furniture will not help that. Cabinets are out of fashion, and we need to find a more practical solution that gives our home a more modern air. 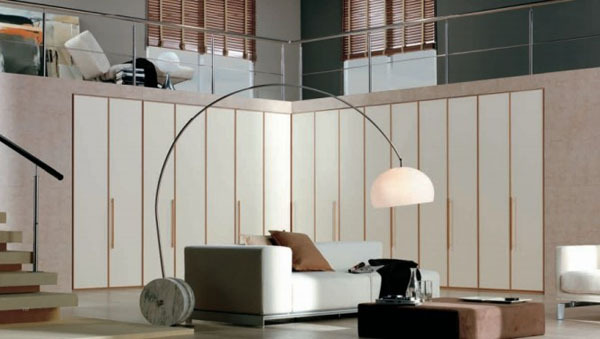 How about if you can have a frameless wardrobe place on your wall, from floor to ceiling? Assorted with the rest of the colors in the room, no one will even tell you have clothes in it. It looks just like a wall, made out of modern material. Massive furnishing does not burden the space, and you will have all the functional space, shelves, and drawers, behind invisible doors. Is your bedroom up in the attic? You are afraid you won’t find a proper solution for sloping ceilings? Not anymore, because you can find the best solutions for these cases also. The wardrobe is designed to fit the slope and shape of your walls correctly, without leaving empty and unusable corners in the room. Again, it will look like a beautifully designed wall, with trapeze shapes. The bedroom will not be clogged by your belongings, as they will have a beautifully designed hideout behind the wardrobe’s doors. Or perhaps you have a vast bedroom, and you want a luxurious wardrobe, with plenty of space for your shoe collections and clothes. You can create the most incredible walk-in wardrobe with mirrors integrated with the walls, spotlight and with a space distribution that will ensure you all the space you need. So it does not matter in what type of house or space you are living in. Get a professional team to design a bedroom wardrobe that fits best in your case. They should be able to use the designated area correctly, to create the illusion of a larger room. If you want to see some good examples or if you are looking for some inspirational ideas for your bedroom wardrobe check Urban Wardrobes. Still didn’t find what is best for you? Give them a call. They will most certainly come up with the best solution for you.